In our last blog we spoke about the sizing considerations to take in to account for an SAP EM server. Now let’s go in to one of the most asked question in SAP Event Management – “Which type of the 4 available parameters should we use? Firstly, what are the 4 parameters that we are talking about? Attribute of a trackable object stored against an EH in table /SAPTRX/EH_INFO – Stored as a name – value pair (PARAM_NAME stores the name of the parameter / attribute and PARAM_VALUE stores the actual value of the attribute. E.g. PARAM_NAME – CURRENCY and PARAM_VALUE = USD. PARAM_INDEX can be used to store different values to allow for the occurrence of multiple parameters with the same name. This parameter can be shown in the SAP EM Web UI on the Event Handler selection screen, list and Detail view. Attribute of a trackable object stored against an EH in table /SAPTRX/EH_CNTRL – Similarly the values are stored as name – value pairs. Notice that the only difference between these 2 parameter tables is the length of the PARAM_VALUE field. The Info parameters can be 255 in length whereas the control parameter can only be 60 in length… This parameter can be shown in the SAP EM Web UI on the Event Handler selection screen, list and Detail view. 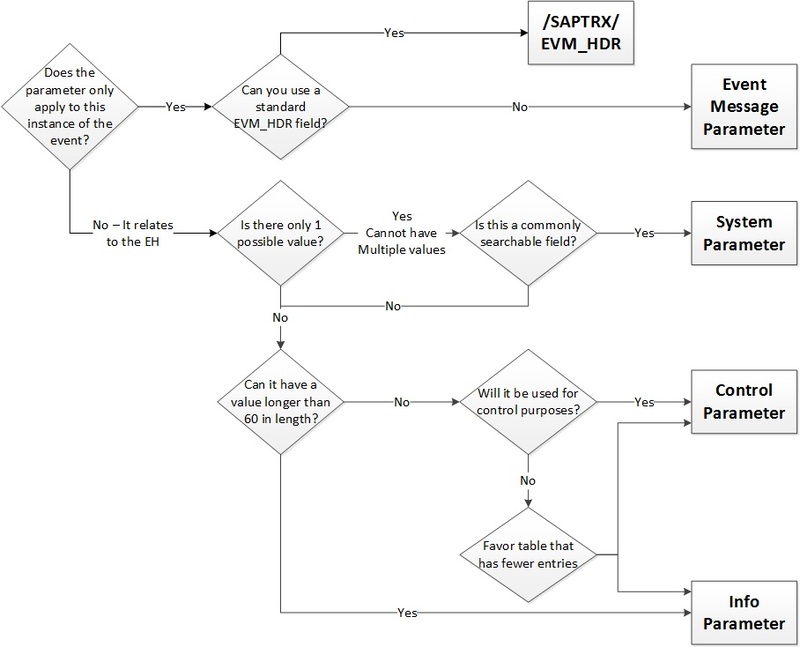 Attribute of a trackable object stored against an EH in a Z table – The ONLY reason to store a parameter in a z-table (system parameter) is when it is frequently used as part of a query search to retrieve EHs. System parameters ultimately get stored in named, physical database fields that can have indexes created against them. Without an index being created for a field in the extension table renders it pretty much useless since without the applicable index the query would not be faster than if it were stored as a control or info parameter. See an example below. Notice the key is just the EH_GUID. This parameter can be shown in the SAP EM Web UI on the Event Handler selection screen, list and Detail view. Note: A view called ZV_[system parameter name] is created as a join between /SAPTRX/EH_HDR and your system parameter table. Attribute applicable to a particular instance of an event. It describes a certain characteristic specific to the event that is attached to the EVT_GUID (The unique ID for that event). It typically should not be stored against the EH because it only applies to that one event. This parameter can be shown in the SAP EM Web UI on the Event Message list and Detail view. Note: The key to the z table that stores the event message parameter is the Event GUID. Its intended use is drastically different from the extension table of the EH. The EH extension table is used to improve performance of queries whereas the event message extension table is used to store extra data describing the event that it is associated with. I don’t think I need to go through all the words in the tree – Hopefully it’s self explanatory and is useful to you. Please leave a comment if you have other ideas or inputs for this decision tree that I use.